Riding without wearing gloves would be like riding without shoes, I just don't do it. I know plenty of beautiful and talented riders who detest the feeling of them but I am not in their club. I agree however that wearing the wrong gloves can affect your 'feel' and therefore quality, good fitting ones are a must. When I get a good pair, I wear them until they have holes in and buy them in every colour! My latest pair are the Pro Touch Performance Riding Glove by LeMieux, seriously well designed, I've ridden in nothing else since they arrived from Horse Health HQ! Beautifully soft, they fit like a second skin and have an excellent size guide here - I am a size 7.5 and wear a Medium in Navy. The finger tips are re-enforced to avoid finger nails wearing through the finger ends - a common glove complaint. Silicone grip points lay in between the fingers and over the index finger where the reins pass over, my favourite feature because it provides so much rein security. I am certain my horse loves the consistency this provides too. The Pro Touch Performance Riding Gloves have a smart appearance. The upper hand has a mesh fabric that allows ventilation and moisture control with an easy stretch so hands can stay relaxed. Fastening around the wrist with a velcro tab. I have worn on the hottest of Summer days and LeMieux have successfully designed a lightweight, yet durable riding glove. Now I need in black, brown and white...buy yours for £19.96 here. A leather cleaning product and sponge live on the same shelf as my riding boots, hat and whip in the tack room, opposite my saddle and bridle. I am convinced this is the secret to good habits; yes I am that rider who wipes over my tack nine out of ten times after I have ridden. This way it is never a big job the night before an event and my leather looks great for it! I get through a leather cleaning product (and usually a sponge too) every six months, a little goes a long way and I am always excited to try a new product. With thanks to Haynet May saw the arrival of Equimins Leather Spray Soap on the tack room shelf. After my first use all I could think was “wow, a spray really is so much easier to use” because my last leather cleaning product was a balm and although great, impossible to apply without getting greasy hands. The Equimins Leather Spray Soap being the opposite, clean, convenient and easy to use. 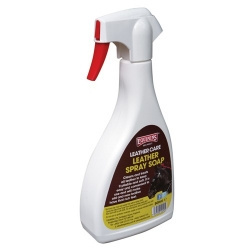 Equimins Leather Spray Soap comes in a 500ml bottle that feels durable and yard friendly with a sturdy spray nozzle. One spritz provides enough soap to evenly wipe over my whole bridle, with boots and saddle only taking a couple more. 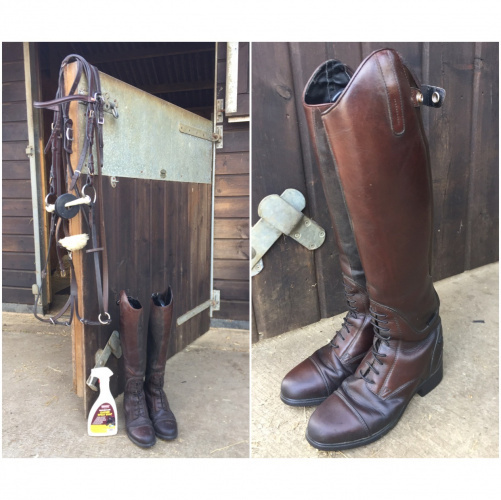 I have used on my old Ariat Bromont boots to my new Kate Negus bridle and all leathers in between, with the old and the new being pliable and soft with a rich shine and beautiful finish after just a quick wipe clean, at £6.95 it is one of my favourites. A 10/10 from Gee Gee and Me. Haynet, Cream of the Crop Bloggers. As many of you know a change in Oscar’s lifestyle led me to explore the benefits of going barefoot. 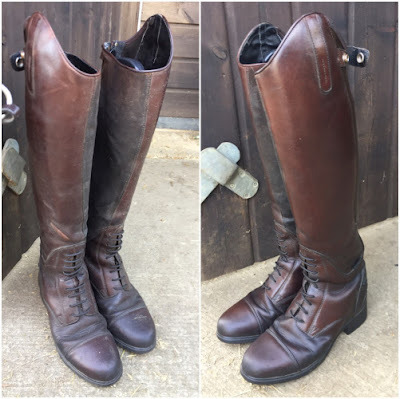 Once I had committed to the change I felt I had been given a new pair of eyes when looking and thinking about equine hoof care. The months before the metal came off I prepped and polished like never before. Learning day by day with a heightened awareness of the products I choose to use, their ingredients and the effect they have on our equines. Naturally this meant love at first sight for Gee Gee and Me and Ecohoof’s Pink Hoof Clay in May’s ‘Go Green’ My Horse Box. The exciting collaboration saw the release of a 250ml Limited Edition tub of the magical Pink Hoof Clay. The clay can be painted onto the hoof, sole, white line area and frog acting as a barrier to infection and once dry acts as a poultice staying in place for 12 hours, before naturally flaking off and degrading into the ground. 100% natural, eco-friendly and full of essential oils, it smells good enough to eat – but please don’t – and gives hooves a pretty pink glow. I have been generously packing it onto Oscar’s frogs and they look healthier than ever and both his shod and bare foot hooves are thriving on it. 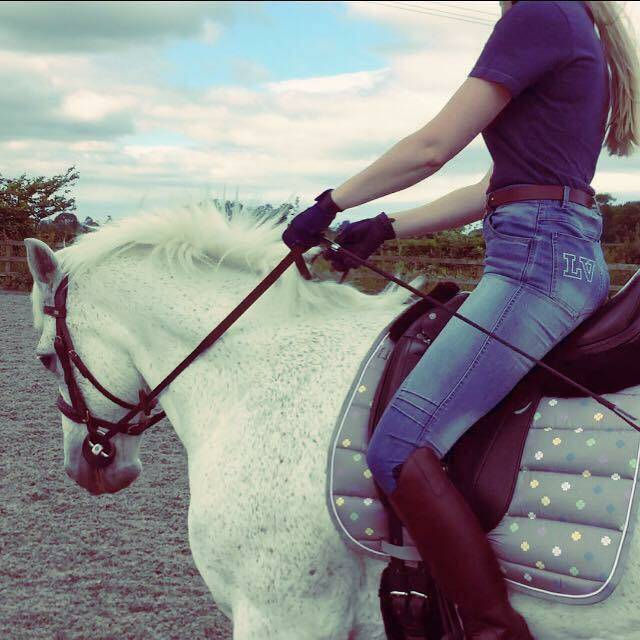 However it became most useful a couple of weeks ago when Oscar ripped a front shoe, taking half of his hoof with it! I had a lesson booked that evening and was almost tempted to remove the other and begin the rehabilitation of his fronts against my plans of waiting for Autumn. After another coffee, I began to think rationally and decided to pack the crater with the Pink Hoof Clay. I have continued to do this, even once the shoe has been reapplied and thankfully although not a lot of hoof is left on one side, the shoe has stayed put and the damage hasn't spread. 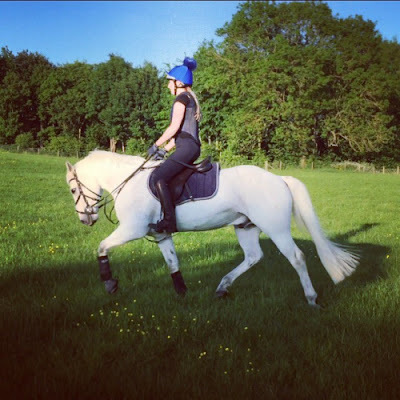 One of my all time favourites from My Horse Box – thank you for discovering it. If you missed out on May’s Go Green you can purchase a 500ml tub here.